Utility location is an essential part of the modern construction project for those aware of HSE guidance HS(G)47, “ Avoiding Danger From Underground Services” and to comply with the Health and Safety at Work etc Act 1974. The consequences of an excavation or intrusion into the ground damaging an underground service can be severe. The operative who strikes the service could be seriously injured or be killed. Aside from the health and safety concerns of blindly excavating or making intrusions, the cost of repairing a damaged service can be substantial. Using the latest Ground Penetrating Radar equipment from Mala and the latest electromagnetic detection equipment from Radiodetection – the RD8000, trained utility surveyors can locate and mark underground utilities. 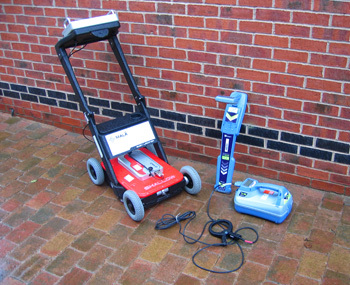 Not only can we trace metallic pipes and power/communication cables, but also non-metallic services such as concrete or clay drainage pipes and plastic gas or water pipes using our Ground Penetrating Radar. 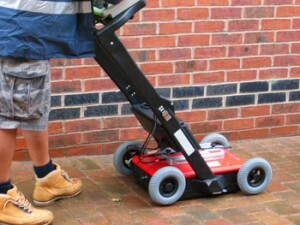 We can accurately give depth readings of each service and mark the line, nature and depth of each service on the ground. If required the marks can be surveyed and presented as an AutoCAD plan to Ordnance Survey coordinates or tied in to an existing topographical survey. We have carried out Utility Location works for a variety of clients. Our largest project to date involved locating and mapping all of the underground services for five secondary schools. Part of the BSF (building schools for the future) Initiative, we were tasked with locating all of the services not only within the confines of the school grounds but also along all of the adjacent highways and access paths too. The project was completed on time and in budget. We won competitive tenders for similar surveys both locally and as far away as Edinburgh, Isle of Wight and Barrow In Furness. We also carry out small-scale location surveys. Typically they are to prove that development areas are free of services prior to intrusive works, such as piling etc. One of our regular clients is a leading supplier / installer of temporary buildings. We survey their sites prior to the erection of the building. The frame is held down by four – six 1.5m long steel pins per column, driven into the ground manually. So it is essential that they are made aware of any services that may be present!